We were having an earnest conversation about the ABCs of buyer personas: what they are, the business benefits they bring, and how to create them. We were well on our way to another informative discussion. So goes this episode of The Heart of Marketing. How many personas do you need? 007: Do you Need a Buyer Persona for your SMB? John: Hey, thanks for joining us today for another episode of The Heart of Marketing. I am John Gregory Olson with my co-host the saucy, sassy, Jayme Soulati. Jayme: Oh my gosh. Can't it be rock hot today? But I am saucy and sassy, I kind of like that better. I love it. John: You can, of course, be rock hot. You always are. I just thought I’d mix it up a little bit. Jayme: I like that because you know how to push my buttons and they make me laugh. I love it. All right, John. John: Well, I’m trying to help out a little bit because I understand you're not feeling 100%. Jayme: Well, it's just the voice. I’m going to crackle, I’ll be baritone today. I’m an alto typically but maybe I’ll be a Tenor today. How about that? I’ll be a Tenor. John: All right, that's cool. Jayme: But I’m not going to croon to you. I’ve got my tea on the side in case I, you know, have to thwart a cough. John: Okay. Unfortunately we don't have cough switches on these mics. Wish that we did. Jayme: I know. So I might be interrupting, you know, something you say with you a cough-cough! John: Great. Well, we've all been forewarned. Jayme: Yeah. And if I don't like what you say, I’ll go cough-cough! John: Yeah, all right. I’ll try not to take it personally. John: Jayme, I understand you’ve got some things that you want to share with us. John: Out of the shoot here. Jayme: Oh my gosh, I do. But before we do that, we have a promo in February with our launch, which is totally official now. I wanted to share that those who subscribe in February, because it's heart month, and heart health month, and Valentine's day, and Jayme's birthday on the 13th, those who subscribe to our Heart of Marketing Podcast, we will donate the heartbeat. Here we go. $1, $1 per every subscriber to the American Heart Association. Whoo! Clap, clap, clap, clap, clap! Can I have a sound effect? John: Oh, yes. How about this? Jayme: Yay! John is the king of sound effects. I do love, I love his repertoire of sound effects. But no, John, we love to start off the show with some thing kind of... Well, I do anyway. I don’t know that you do. I don’t know what you’ll say. John: I just roll with it, you know. Jayme: I get it, I get it. Because you can’t get in a word edge-wise typically. No. What's been happening in the world of marketing? And there are two things that I have to mention. I’d be remiss if I didn't rip Radio Shack because that poor company has been around for 94 years. And we all know this week, last week, RadioShack filed for bankruptcy protection. I don't know who’s going to help them at all because the poor company is so irrelevant. John, I think relevance is one of the buzz words hanging around marketing circles these days, would you agree? John: It sure is. You hear it all over the place. Jayme: And I love The Wall Street Journal. I read that everyday. And the editorial in the back page said that RadioShack's biggest challenges were coping with the rapidly changing digital world, which is called disruption. We covered disruption, episode two, of The Heart of Marketing. The rise of the web in electronic sales and the consumer shift to mobile products, from people like Apple or companies like Apple. Apple's not people. So that’s pretty good surmise of why RadioShack failed. They lacked the relevance anymore in a rapidly changing world. And I don't think they even knew their buyer persona. John: I don't think they did either, right? The only thing that surprises about that story, Jayme, is that they lasted as long as they did. Jayme: Absolutely. I have to agree with you. You know, I walked into a RadioShack once looking for one thing. Don't know if I could find it. And it was like the mish-mash of products of the shelves were so like, what is this? Does anybody use this anymore? and the store is totally empty. But Sprint is going to take over half their stores and co-brand with the former RadioShack. I don't know what’s going to happen to its brand name but maybe it should just kind of go away. Jayme: Yeah. Speaking of going away, how about that guy, Brian Williams? That NBC newscaster who decided to be inauthentic? John: Yes. He's got a little credibility problem, doesn't he? Jayme: You know, I got to wonder why. Because the dude is on the top of the heap with a huge NBC News Broadcast and everybody loved him. I mean, he got $200 million in ad revenue in 2013 on his show. And all of a sudden he decided to go into the lies, the lies that keep getting worse. I guess the buzz word for me on this one is transparency and authenticity. But when you’re transparent with a lie, then what's going to happen to you? John: It kind of erases itself, doesn't it? Jayme: Yeah. I mean, did he think his buyer persona was going to want to hear this big, huge, you know, getting shot in Iraqi helicopter stories that were lies. And every other story that he ever told on the air, everybody’s kind of wondering, gosh, those lies, too. John: Yeah. What else did he fabricate? John: Jayme, I keep hearing references to buyer personas. Are you leading up to something there? Jayme: John, you’re just so smart. You’ve got a keen ear-sight for the words that I’m throwing out to our audience today. John, take it away, John. John: Okay. I guess what Jayme is trying to lead us towards is our topic for today, which is the subject of buyer personas. And we want to take a look at whether or not a buyer persona is really going to help you get to the heart of your marketing strategy. So we’re going to take a look at what is a buyer persona? John: And what are the benefits to using buyer personas, and a little bit of time on what goes in there, creating one, and then at the end we'll wrap it up with some real world applications for your business. And I know that Jayme, you’ve been kind of on the fence about this subject. Jayme: You had to shoot. John: Yeah. And you're the one who brought it up that we had to do a show on this topic. So what brought you to that place? Jayme: Yeah. That’s a good question. And I think it's also good for our Heart of Marketing listeners because I do want to teach, as we go through our show topics, and teach people things that might be confusing in marketing or how, if a company is struggling with this certain area of marketing, we should address it. And for me persona… I’ll tell you, I have mentioned before on this show that I invested in HubSpot a couple of years ago. And you know, while I won't comment on what it did or didn't do for my business, I will say that one of the first things it taught was persona. And as a public relations professional, persona wasn't something that P.R. delved into as much as a marketer. But as we've also discussed, the blend of P.R. and marketing and there isn't, you know, a fence on what P.R. doesn’t delve in. So it's an important topic for me to get, for everybody actually, to be more aware of, John. I think you've got a lot more experience with persona than I do. John: Yes, I have played around with some a bit. I’ve used them with some marketing programs that I’ve developed for some clients. And it’s a subject that’s been of interest to me over the course of my career because I’ve always been fascinated by the psychology piece of marketing. You know, you have your science and you have your art. And somewhere in between there is this, what are these psychological factors that are going on in the heads of your customers and your perspective customers, that you can figure out to help drive your business. And that’s where my interest in personas came. And if we have time, Jayme, at the end I’ll say this at the end. 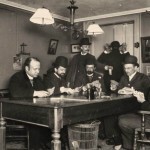 I’ve got a story about my first venture into personas. Jayme: Gosh, I want to hear that story. I want to make time for that for sure. Well, John, what exactly is a persona? Because let’s just start off with a definition. Would you help us with that? John: Yeah, most definitions focus on a few characteristics. A persona is a fictional, generalized representation of who your ideal customer is. And that is a prospect who’s actually interested in buying. So it looks at the individual behind the demographics. A lot of people confuse a persona with a customer profile. Jayme: I saw that. Yeah, I read that around in the web today and everybody said they’re so totally different. So what's your definition of that? Jayme: Okay, that makes sense. And when does someone want to try to develop the persona and can they change over time? John: Well, you know, I don't know the definitive answer to that, the second part of that question. I suppose they could. 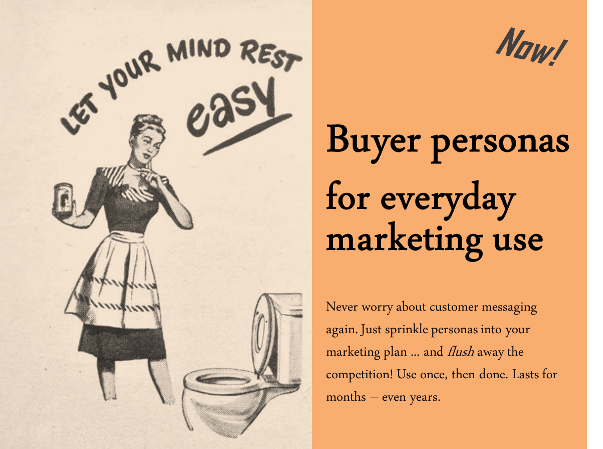 As you learn more about your customers, you would want to be able to develop your personas in more depth. But to answer the first part of your question, when do you want to develop them? I would say it's really at the beginning of your planning stage. One of the last episodes, we talked about your business objectives and how to develop them for your strategy, in building your strategy and your objectives, and a big foundation to that is understanding who your customer is. John: That’s at the beginning stage of the process. Jayme: Okay. And here's a big question too, John: can a company, regardless of size, can they survive and do good marketing without having a persona? What if you don't develop one? John: I don't think it's a question of the size of the company. But it's a matter of doing a lot of guesswork. If you don't have one, you're guessing. And most companies just don't have the time or the resources to be doing guesswork as far as what they should be saying to their customers and how they should reach them. So I think that some form of customer persona development needs to happen. Jayme: Well, I know you're trying to... You and I have been talking since probably September of 2014 on this podcast and planning for it. And one of the things that you did with both of us was to look at a persona of who our listener might be. And it was very helpful because every company, regardless of how big they are, you need to know who you want to market to and who is going to buy your products. Who’s the ideal customer who's going to buy your product? And once you dive into those demographics or where they live, how affluent they are, what their age group is, are they married, things like that, then you dive into another level deeper, John. What other things, what constitutes a persona? What should you develop if you don't have one or you want to tweak the one you have, what should people do? John: Well, it's all of those things that you just said, plus then you want to go a little bit deeper into understanding what their goals and their challenges are in their job, in their role as a decision maker, what their values are, what drives them, you know, at that value level, what do they fear? Those kinds of things that get towards their attitudes and their values help to enrich the whole understanding of who your customer is. And that’s what goes into a persona. Jayme: Sorry, I was going to ask a question. Here's what’s really confusing … And I want to also say that that just because I have a core P.R. background, we do look at audiences in public relations. We target our messaging to an audience, but it's more broad. So I’m not telling you that we don't know who our customer is, or who our target is, or what we’re doing, right? But back to what you said, John, what if, and I hate this what if thing, but let's say you have this ideal persona, the person who you want to buy your products and you want to market to. What if there's an anomaly? What if there’s a person who doesn't fit your persona at all who’s just consistently buying your product or you know... How does that all work, John? Is it just you ignore that and say, "Oh, great. We just have a guy from another demographic or something or another persona profile.” Can you talk to me about that a little bit? John: Well, the important thing to remember is that a persona is a generalized description. So it's like a composite. It's not going to have all of the characteristics of all of your customers. That's the first part of how I would answer that, Jayme. And the other thing that I would say is that depending upon your business and your selling situation, you're likely to need more than one persona that will help you to segment the important customer groups to your business. And that's where you make distinctions – we have this persona over here with these characteristics, and then we have this other persona here with these characteristics. Oftentimes you have to look at what the decision process is within the company that you're trying to sell into. And they’re going to have people in different roles depending upon what you're selling, how complex your product is. So if you're selling a piece of business software and you're selling into a larger organization, you're going to have people from finance involved in the decision, you’re going to have people from the marketing area, you’re going to have executives. So you need to look at each of those and probably develop a persona for each one of those roles because they’re going to be looking at the buying decision from a different vantage point. Jayme: So how many personae should a company have then if you say ... I mean, I guess there's no real answer to that, huh? John: There really isn't. It's as many as you need. The danger is developing too many and getting really mired in unnecessary details. But I guess it could be anywhere from two to five, if you're a larger company it could be 20. Jayme: And I think big data also contributes to helping analysts determine a persona, wouldn't you say? John: Definitely, because you're going to be looking at all of the demographic information that you're capturing about your existing customers. And you’re going to be looking at their buying behaviors and putting that into the equation when you're segmenting. So all of that comes down to what kind of data you can get. Jayme: You know, this is a great little moment to dive into an example of something that's kind of funny. In today's Wall Street Journal, once again I got some great gems out of the Wall Street Journal today. On the bottom section of the front page there's always this feature piece that's kind of funny and clever. So “Trying to Clean Up, Marketers Give Bathroom Humor a Go. And this is about “Cheeky Ads Seek to Relieve Germ Focus, but Not All Are Bowled Over.” And guess what it's about? Toilets. John: I’m sorry. I just never ever thought I’d have a chance to use that sound effect. So thank you for bringing the story to my attention. Jayme: Oh my gosh. I will tell you what, this is the topic that people love to ignore and then, hey, could you like to be a bigger marketer for a toilet company? And I guess in Europe, they’re pretty much… Just cracking up. There's a woman, a picture of here, a woman in a prom dress sitting on a commode with her makeup on in a cattle farm, which has got cows around her and stuff, the toilet paper nearby. Yeah. So it is an ad for Poo-Pourri, a maker of the air fresheners. John: He’s willing to admit that to the world? Jayme: I know. Can you believe it? But maybe somebody else did. And that’s the only thing I can think of about the poor guy. But gosh forbid that we go to his house and have to use the restroom. I know. Terrible. So would he be the right persona for bathroom and the septic and toilet bowl cleaners? Probably not. John: Probably not, because he never uses them. Jayme: And I think that you have to look at who are the prime cleaners of bathrooms, and I am sure that it's a woman. A mom. So let's dive into this, John, as an example of how do we find the buyer persona of a toilet bowl cleaner? What do they do? The marketers sit around and they look at who their buyers are using the data they already have, right, or the coupon clippers. John: Yeah. That's the starting point always is try to get a glimpse of who your current customers are. John: What you can learn from your data, and this comes down to how sophisticated your data capture capabilities are, but look at as much as you can learn about how frequently they buy and their demographic make-ups. Look for clusters where there's commonality where you can say ‘okay, this group of buyers, they’re in this age group and they live in rural or urban places.’ And if you happen to know their vocational areas, maybe they’re professional people or whatever, you try to group those things together from the data that you have. Jayme: You know what’s really funny? Do you remember the Old Spice man? Old Spice guy who just women went crazy over? John: Oh, yeah. Right. The guy without the shirt, that's all I remember. Jayme: Oh, yeah. The buff dude in the shower who was so rock hot. I mean, I’m telling you, everybody remembers the Old Spice guy. Anyway, so what they were trying to do with these toilet bowl cleaner ads was put hunky guys in a bathroom with a woman standing there holding a toilet brush. And you know, is that really how you get my attention? Maybe they thought that they work on, and get my... I guess I would have taken note, right? I would have looked at the ad going, nuh-uh, okay, this is not flying for me. But maybe it would fly for a younger woman who has to clean the toilet. I don't know. Maybe it would get somebody to buy. John: Or maybe they’re trying to make the association that a macho man cleans the toilet. And they’re trying to appeal to men in that commercial? John: I think that's a great point to move on. Jayme: I totally agree. We’re going out of the toilet humor because it wasn't really funny. But you know, I was laughing. John: It wasn't funny at all. Jayme: No. I will stop now. John, let's go into the heart of the matter. John: Okay, we’re right into our last segment of the show. And this is where we get to the heart of the matter. We take what we've been talking about and come up with our advice and our tips for real life applications. Jayme: Well, before we do that, because you know me, I’m always going to, you know, revel in this. John: You’ve got to zig when I zig. I’m getting used to it, though. Jayme: I’m so glad because, you know, I cannot conform. I cannot conform to script and structure. I was going to say scripture, and I said script-, structure. Yeah, say all that fast. Okay, great. No, my question for you is, when you got your persona, you think you nailed it, what do you do with it? 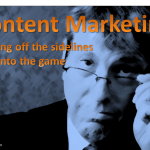 How do you incorporate the persona into the marketing campaign, or the writing, or the content marketing, John? John: Well, this gets into a big conversation for what really are the benefits to doing this. And there are more than you might think. The obvious benefits are that it really helps you to segment your audience with much deeper insights than you would have if you were just profiling them. 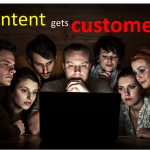 But the other thing is that once you have your buyer personas in place, you can use that information to help you map out your whole content strategy, what you're going to say to each customer group along the way in the buying process. 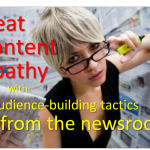 Once you have a solid understanding of that audience, it makes your content marketing piece that much easier. Jayme: I kind of love that. John: And similarly, it helps when you're focused on lead generation, it helps you to lead your prospects through the sales funnel because you have a better understanding of what their thought process is along different paths along the way. And so that helps you to nurture that lead from a warm lead, mildly interested, to taking them all the way through to raising their hand and saying, ‘I’m ready to buy.’ So it's great for your lead generation. And then another thing that people may not have thought of is your product development. Because a lot of product development happens… I have been in companies where a lot of product development happens in a vacuum. You've got product development people that are so close to their product that they just fall in love with it, they develop new features because they can, because the new technology enables it, and then they keep building on it, building on it. But they don't ever go out to really find out, is this something that the customer really wants? And so the persona will help avoid that pitfall when you're developing products or enhancing your product. Jayme: This is a great conversation. And one of the things that as a blogger I try to do is I do imagine who is reading. And I’ll be starting off very soon on a content marketing strategy and execution for an auto collision center. And for the first time they are going to have a blog. So I do know that one of their big customers is Mercedes Benz owners. So that right there says, okay, I've got a whole persona that I can create oriented to Mercedes Benz. But then on the flip side, they’re trying to get the Ford F-150, their truck is now going to be aluminum body. So what does that mean for collision repair? Well, it's a whole new way of repairing those vehicles, and the owners of those trucks want a solid quality collision repair center. So there's two buyer personas I’ve got create, right, that I need to develop content for. And I imagine that we can probably go on and do a buyer persona for every vehicle type and maybe they’ll, you know, run and blend together. But I've got to be very aware as I embark on this path for my client that, you know, these are the things that I’m trying to orchestrate to get their attention. Jayme: Yeah. I might have to enlist your help, John, on creating those because I’ve really got a huge expert in you of my own. Because if I had to do that by myself, I probably would do it in my head. In my head, I’d do it, but not on paper, yeah. Jayme: How did you know? You’re starting to get the hang of me pretty well, John. Seven episodes. I am so impressed. John, do we have time for that story you said you had? John: Oh, you know, we’re really kind of running late here. But maybe, okay, I’ll wrap it up with this. My first venture into customer personas was back in the early 2000s. It was about 2002-2003. I didn't even know what a persona was. Never heard of it. I was working in a large company and one of my responsibilities was to create tools for marketers and creatives to develop the brand message and help enable that process. And I was working closely with our market research group and pretty much every marketing group across the organization. But I was looking at the market research data that we were capturing on our customers. And we had so much data. It was amazing. But it was coming from all different sources. There was the primary research that we were doing, there was publication surveys, readership surveys that we were getting the data from with all the publications that we are partnering with, there was all the data that we were pulling on the customer analytics, buying behaviors, all that because we had a really powerful database. And it was all kind of running parallel. There was nothing that was pulling all that information together to help give insight to the marketers and the creatives. And the other piece that… I was doing a lot of reading on psychographics… That was kind of starting to get really big at that time. And I was trying to come up with a tool that the marketers and the creatives could use that would bring together all of this rich data plus the attitudinal type of data that you get from psychographics that we had. Remember the “Yankelovich Report?” I think it’s still out there. Jayme: It rings a bell but I’m not sure that I can tap that right now. John: They were really popular and they’re probably still are out there. I haven't seen it for a while. But they were publishing research that they were doing on the generational attitudes. So they were looking at demographic groups by Baby Boomers, and Seniors, and now I’m sure they’ve got your millennials and your Gen-X and all that, and compiling attitudinal psychographic kind of things from that. So my idea was to go to the market research group and say, "Hey, can we initiate a project where we pull all of this together into a narrative that would really put a heartbeat on our customer data?" That was the wording I used back then. I’m not just referring to the title of our show. And that was my goal. And you know, they didn't want to do it. So I enlisted one of my copywriters. What I said was: How valuable would this be if we took all this data and developed a narrative of a typical, we picked one segment, and what this customer looked like, and we combined all of this information. And he is like, wow, this would be great. I said, “Well, do you want to take a stab at it?” Because what we need, more than reports, we need a biography. We need a fictionalized general picture. So he did. He wrote this beautiful summary and I was really excited about it. I was like, this is great. We can model this after all of our key customer groups. And this would be a huge win for the company, blah-blah-blah. Got back to the director of market research and she had a conniption. "What are you doing?! This is not based on scientific methodology. This is not primary research. I can't sign off on this." And that completely torpedoed me. John: Yeah. And actually, I ended up getting into some trouble just because of the political situation there. I think it came down to the fact that they hadn’t created it. Jayme: Oh, yes. I haven’t thought of it. John: It’s like, it was the not-me-ism or whatever, you know. I didn't create it so it's no good. But years later, as I started reading about this development of personas, learning more and more about it, it occurred to me that that's exactly what I was trying to do. Jayme: Wow, you are so smart. That is a great story. Jayme: That is so cool. And you know? I’m so impressed by that, and what I’m going to do is leave the audience as well with free resources that I found today or in my own research about this. Heidi Cohen writes the Actionable Marketing blog. And she has a huge, huge piece on buyer persona already, just persona in general that is pretty in-depth and kind of frightening because it goes very deep into imagining who your buyers are. And I will have that resource on our show notes. And secondly, there's a gentleman named Vincent Messina who wrote an article about buyer persona versus buyer profile. I’ll have that also. I just commented on his blog today. And he references in his blog Tommy Zambito who he calls the buyer persona guy. And I will have those three U.R.L.s of where you can find deeper insight into personas and profiles to understand them more, if you’d like. I’ll have those available to our listeners in the show notes. John: Well, that's our show for today, I’d say. Do you? Jayme: Great show, John. I enjoyed it especially the section where I got to laugh a lot. John: Yes, me too. It's good for the heart. AHA, laughter, good for the heart. You see what I did there? John: Okay. Jayme, why don't you take us home? Jayme: Go be rock hot, guys. See you soon. John: Till next time. Remember, go for the heart, you won’t go wrong. Man 2: Thanks for listening to the Heart of Marketing Podcast with Jayme Soulati and John Gregory Olson. Don't miss our next program. 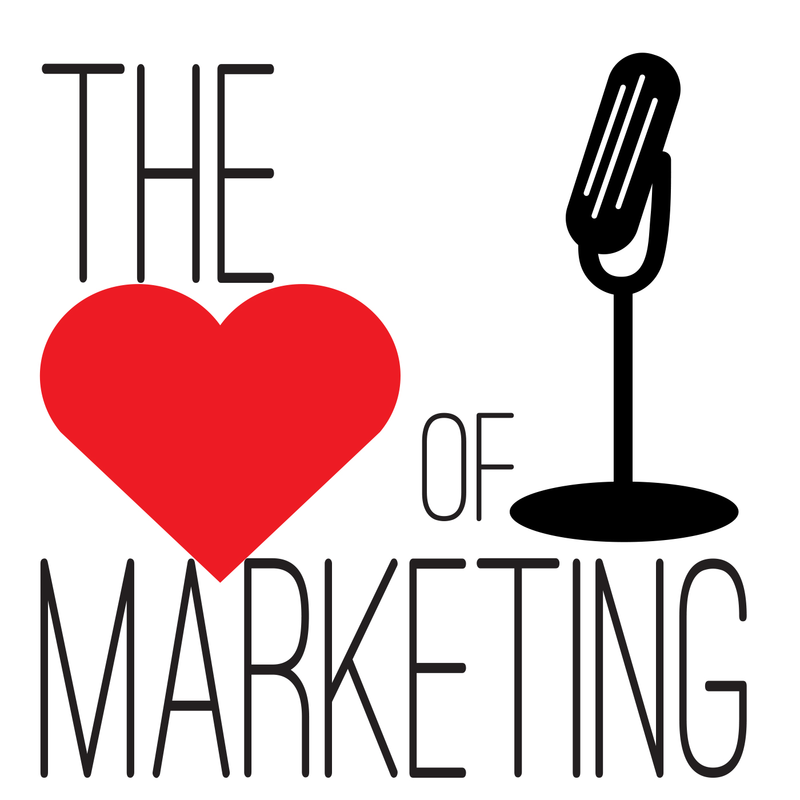 Subscribe to the Heart of Marketing Podcast today.